Hello everyone! Joan here. We would like to apologize that we haven’t had a blog in a while. Christmas kept us super busy, but trust me, we definitely had ramen on our minds the whole time. 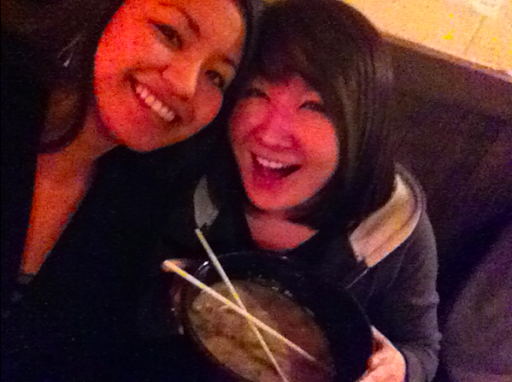 We decided to go back to Hacienda Heights to check out another ramen house. I gotta say, we became very fond of Hacienda, since it’s closer to home, and has a lot of neat shops to check out and many ramen houses! Before we headed over, we looked up a couple of places online, but weren’t sure if any of them were open on New Year’s Day. I called a few, but none answered. Regardless, we headed to Hacienda with a list of 5 places. When we got there, all of them were closed!!! Luckily, only one was open, but… it was a place we’ve been before, Daikokuya. They recently opened one up in Hacienda. We went there anyway. Maybe we’ll have a different experience! 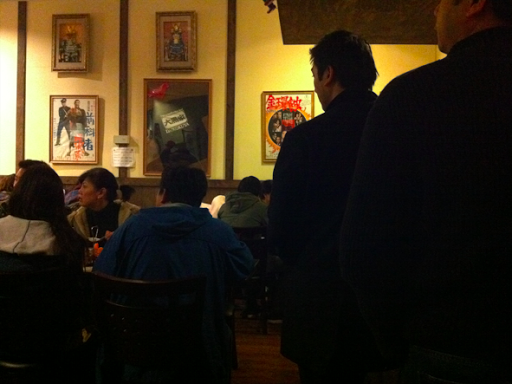 Because we’ve been to a Daikokuya before, we guessed that there would be a line. And sure enough, there was. Just so you know, it was freakin’ freezing that night! Must have been 40 degrees or so. A good bowl of ramen sounded really good that night. Luckily, it was just Tanya and I, so we managed to get seated first! Last time it took us more than an hour to get seated, this time it took 5 minutes. This place was really small compared to the one in LA. 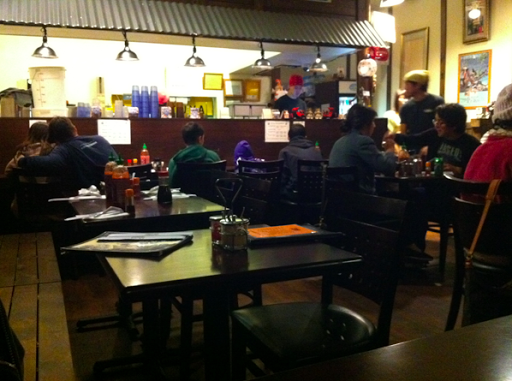 It was about half of the LA ramen house. The photos above were taken from the front corner of the restaurant where we sat. Right when we sat down, a swarm of people crowded the tiny wait area. We were glad we got there when we did. We ordered the same Dakokuya ramen, but I wanted to try something different. 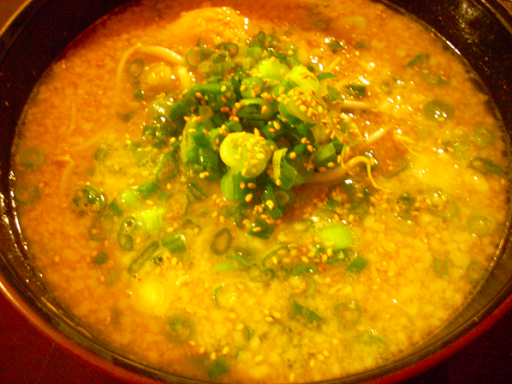 There was something called kotteri, which from what I read was a richer broth that came from the back fat. That sounded good so I tried it. When I got it, I saw a swarm of little fats floating in my broth! I should have read it more carefully, I didn’t think there would be back fat floating in my ramen! I seriously have been trying to eat healthier these days, and when I saw my bowl, I freaked out. But I figured, what the hell, it’s New Year’s Day, let’s celebrate! I took a sip of that fatty broth, and OMG! It was really tasty! The broth was extra rich with all that pork goodness and the back fat was delicious. I remembered to ask for firm noodles and to remove the bamboo. The egg was warmer than last time, but the center was still cold! Ugh! Still, the ramen was so good. I couldn’t finish my broth though, it was too fat for me. We finished off the meal with some green tea. The service was pretty good even though the wait for our ramen was long. But our ramen was delicious and our server was this totally cute Japanese guy that could barely speak English and that made up for the wait. We’ll probably check out one more ramen house in Hacienda before we venture out to further cities. Thanks for reading and join us next time on our next ramen run! Happy New Year! A place we really like to go to after we eat in Hacienda Heights is a place called Genki Living off of Fullerton Rd in heavily asian market place called Diamond Plaza. They call assorted snacks and meals in this place. It is small but they are pretty quick. We like to get the crepe with our choice of filling (ice cream, fruits, toppings). They have other things like takoyaki and sweet bean, fish shaped bun. Everything is surrounded by windows so you can see everything made. 1 Response to New Year Ramen!